Sophie and I challenged ourselves to put my oft repeated refrain to the test the other day. 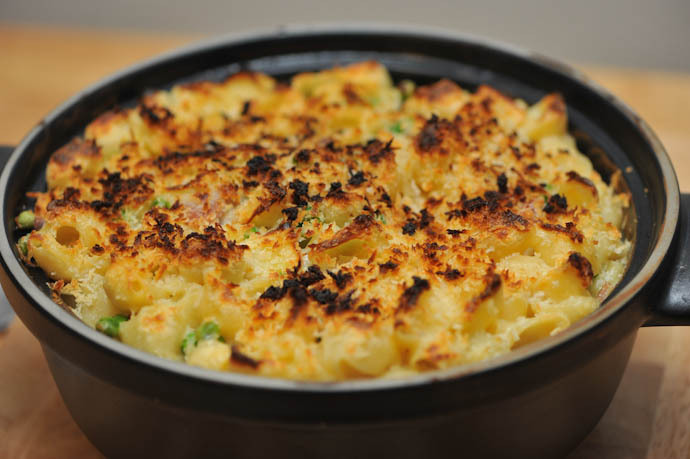 Perusing the Founding Farmers' website/menu with the goal to recreate a dish at home we decided to make the mac 'n' cheese. Our interpretation was a complete success. Sophie had a good time helping shop for the ingredients and reminded me not to forget the peas that I made her run to the frozen food aisle for while we were in line. When we go to Founding Farmers someday Sophie plans to make a comparison if she doesn't order the chicken and waffles instead. In a small sauce pan heat the milk and ham together until hot then allow to sit while you prepare the pasta. Cook the pasta just shy of done because it will cook further when you bake the end product. Drain and rinse with cool water to stop the cooking. In the same pot you used for the pasta melt the butter over medium heat until foamy. Add the flour and cook stirring constantly until light brown. Whisk in ~1/2 cup of the hot milk and then gradually add the rest of the milk whisking constantly until smooth. Add your cheese and continue to stir until melted. The ham will now be suspended in your sauce. Taste and season appropriately with salt/pepper. Add the diced apple and peas to the sauce and then toss with the pasta until thoroughly combined. Pour pasta into a buttered casserole dish (10x10 pan or what have you). Sprinkle panko on top. Bake at 400F until bubbly and the bread crumbs are browned.